In that time, he says he has seen the impact of persistent violence in his community. If fact, he says he himself has felt it during run-ins with local police. “Then we have communities who are perpetually traumatized. Like myself, who at 15 was the victim of (police) brutality,” Williams says. Williams says the incident has stuck with him and made him anxious and suspicious. And, he says, it’s not just him. “Because there are so many people who are affected by this. It is not just people who are perceived to be gang members or who they call thugs. It's grandmothers, fathers, people who are everyday folks,” Williams says. And as a result, he says people feel abandoned, trapped, and helpless. Williams says for many there is a depressing lesson learned from seeing and growing up around violence…you are less than another person. What Williams is describing, depression, drug use, and aggressive behavior are all symptoms of post-traumatic stress disorder. Researchers even have a new name for it: toxic stress. Williams agrees but puts his own spin on the concept. “I call it present traumatic stress disorder. When you have post-traumatic stress disorder it means the trauma has ended. With our people it is a perpetual trauma that is inflicted on almost a daily basis,” Williams says. According to researchers, along with the other symptoms, toxic stress and PTSD can lead to sleeplessness, anxiety, depression, and flashbacks. In children, the effects can negatively impact their development. Researchers are finding that people who live in violent areas are having many of the same symptoms as soldiers who served overseas. Gloria Hernandez (holding a no shoot policy sign) at a recent rally. Gloria Hernandez is an organizer and mental health advocate who lives and works in southeast Fresno. She says even for someone like her who works to help the members of her community, its health effects are unavoidable. “For example, if there is a drive-by next door, or the officers are beating up somebody and I witness it, I am not going to sleep all night. I am going to be all scared they are going to come back. So it stresses you out. If I live in the barrio, and I do, I see it all the time,” Hernandez says. Hernandez says the effects start in children and continue into adulthood. And many people don’t know what to do to find proper health care. “The problem is accessing those services. And a lot of them is it has to be voluntary. And a lot of people don’t have the insight to get and get the voluntarily services,” Hernandez says. Pastor Floyd Harris runs a church in southwest Fresno. “It has been a very depressing life to live in this community here,” Harris says. Harris says for many people the threat of violence is constant and exhausting. For him, one incident sticks out: being pulled over by police with his two young kids in the back seat of his car. “Pulled over by a cop. Looking for the barrel of a gun. That’s just post-traumatic stress itself! Looking down the barrel of a gun and your family is in the car. Who goes through that and you normal?” Harris says. Like Hernandez and Williams, Harris describes symptoms that resemble PTSD, especially with his children who were very upset by the run in. “That’s not healthy. And so, when we see something that is not healthy it is our obligation to fix it. Get it some medicine. Take it to the doctor. Diagnose it,” Harris says. Williams, Hernandez, and Harris all voiced a similar concern...that there are not enough resources for mental health care for people living in violent or underserved communities. Still, it’s not entirely fair to say that the health care system has abandoned these communities. As we previously reported, in Kern County the government spends around $160 million of public money on mental health care. The number is even higher in Fresno County, close to $200 million. The county employs roughly 600 various mental health care professionals. And spending since Proposition 63 has gone up. Dawan Utetch, the director of the Fresno County Department of Behavioral Health, says they are changing their focus to address and understand the negative mental health consequences of toxic stress. “Definitely, I would say in the last decade or so there has been a heightened recognition of the role of trauma in the development of a number of mental illnesses as well as what we call emotional disturbances in children,” Utetch says. The comparison to PTSD, Utetch says, is uncomfortable when thinking about American cities but not all that far off. She says they have changed their approach to responding to trauma to try and be closer to the front lines and less stuck in their offices. the Fresno County Department of Behavioral Health is considering using unmarked cars so as not to draw attention to their clients in tight knit or rural communities. It’s far easy and cheaper, she says, to treat people early before they develop more extensive and expensive problems as an adult. But Utetch also acknowledges there is a social stigma against treatment in some marginalized communities. “Trying to break down those barriers. And break down the resistance and the stigma to seeking services. 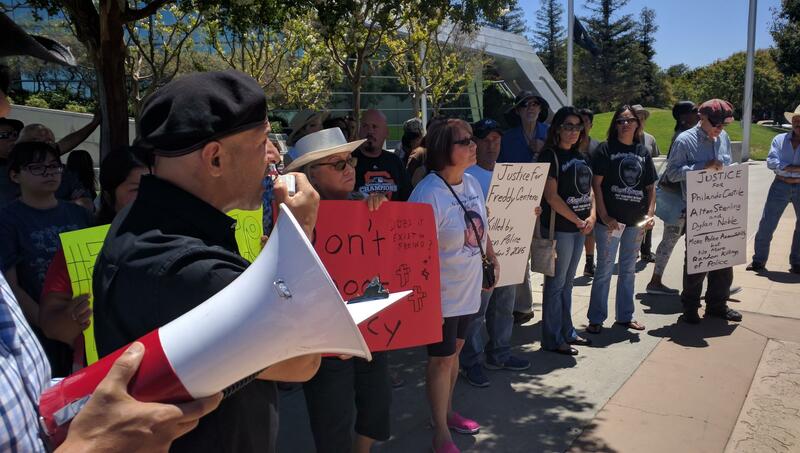 And also being open to the concept that if you don’t take the services to where people are, you are not going to make it comfortable for them,” Utetch says. For example, the department is considering using unmarked cars so as not to draw attention to their clients in tight knit or rural communities or allying with culturally sensitive locals to act as liaisons. Gloria Hernandez is one of the people they work with. And they are not the only ones trying to bring services to traumatized people. 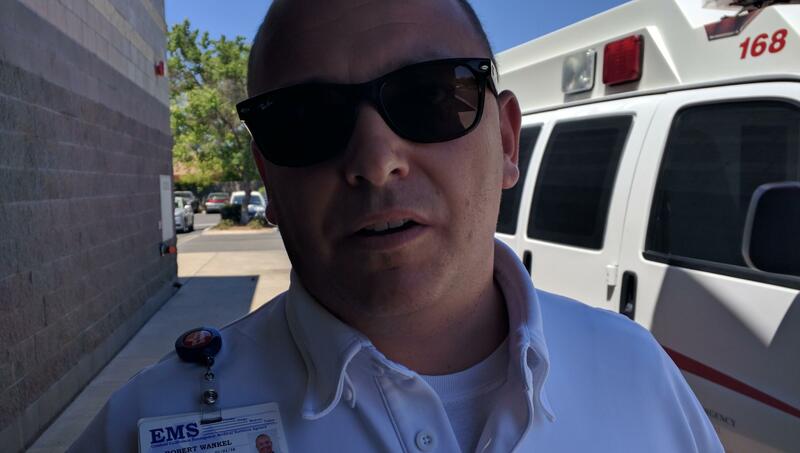 Ken Katz oversees a new program at American Ambulance in Fresno that specially trains EMTs and paramedics to respond to mental health crisis in the field. Katz says they work in conjunction with police during a call but are often in a better position to help a person find the care they need rather than winding up in jail. “Maybe even potentially release at the scene with a safety plan. Maybe take them some place other than a hospital. Maybe in talking with a patient we will discover they have missed their last appointment with their psychiatrist. Maybe we can call the psychiatrist and if we can get them in we will take them there instead,” Katz says. And the number of encounters the paramedics have is somewhat astounding. Over the course of the year, they respond to an average of 24 behavioral health calls every 24 hours. One of those specially trained EMTs is Robert Wankel. He says the program is already working, telling the story of one homeless drug addicted woman who he helped get into a drug treatment program. “I gave 8 minutes of my life to this woman to protect herself and also to give her the option of opportunity. That is priceless. That is what this community needs for people who are in need of help,” Wankel says. But for Joey Williams new efforts are too little too late. He references the parable of the Good Samaritan, saying he would rather address the cause of the trauma rather than just treat its symptoms. “Do we want to set up a clinic right there? So that everyone who is beaten and robbed can get fixed at the clinic? Or do we want to repair the road and organize to make it more safe?” Williams says. And addressing the causes of trauma could help more than just the people who live there. The police officers who patrol are not immune to the consequences of seeing or being involved in violent encounters. We will look at the personal effect on officers and what is being done to help them in the next part of our series.